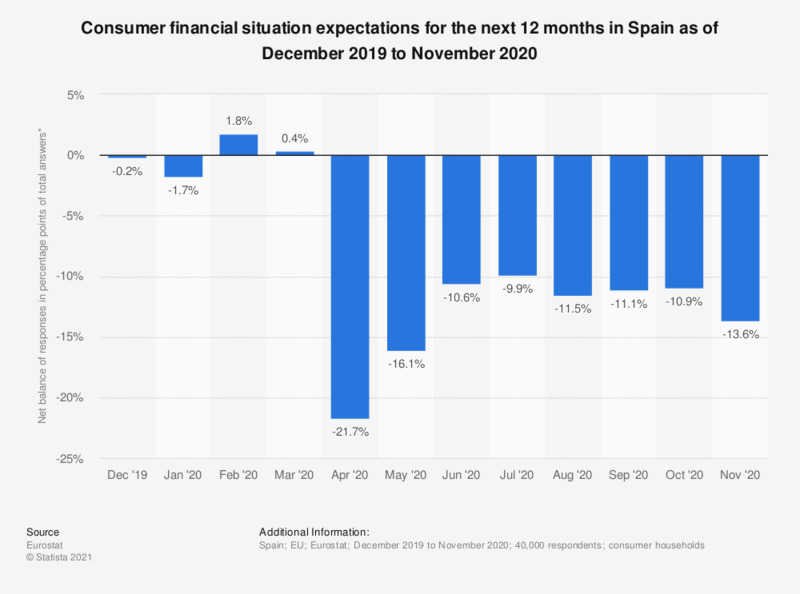 This statistic shows the change in expectations for the consumer financial situation over the next twelve months in Spain from October 2017 to September 2018. The financial situation of consumers was expected to improve slightly in the future (net balance of responses amounted to 1.1 percentage points of total answers) as of September 2018. The data published every month are derived from surveys conducted by national institutes in the Member States. The purpose of the Eurostat consumer survey is twofold: first, to collect information on households' spending and saving intentions, and second, to assess their perception of the factors influencing these decisions. The questions are organised around four topics: the households' financial situation, the general economic situation, savings and intentions with regard to major purchases. The consumer survey is entirely qualitative.